Canadian Prime Minister Justin Trudeau became the latest luminary to try the Microsoft HoloLens holographic goggles, at the opening of the Microsoft Canada Excellence Centre in Vancouver. MicrosoftCanadian Prime Minister Justin Trudeau tries on the Microsoft HoloLens goggles. HoloLens is a wearable Windows 10 computer that sits on your head and projects three-dimensional “holograms” into your field of vision. It’s pretty neat. Microsoft CEO Satya Nadella wasn’t on-hand to do a personal demo with Trudeau, as he was with Salesforce CEO Marc Benioff. But Microsoft President Brad Smith was around to welcome Trudeau and promote Vancouver as a rising star in the tech market. The Microsoft Canada Excellence Centre, or MCEC, will house developers working on the whole range of Microsoft products, per a blog post. This might have been a particular thrill for Trudeau: In addition to being a an athlete, Trudeau is known to be a bit of a nerd, schooling a reporter with a quick lesson on quantum computing back in April 2016. 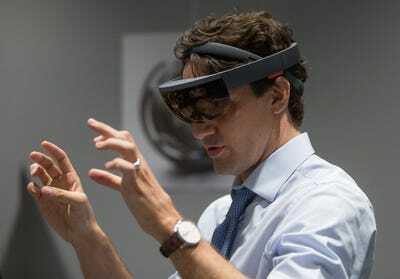 We’ve reached out to the Liberal Party of Canada to see if Trudeau enjoyed the HoloLens. We’ll update when we hear back.